Chlorophyll and chloroplast are both found in plants. Both words start with the prefix “chloro” – the Greek word for “green.” However, there are slight yet vital differences between the two. Chlorophyll is a plant molecule that plays an important role in mixing and creating the plant’s food in the process of photosynthesis. Photosynthesis happens when water from the plant’s roots, air from the plant’s stomata, and sunlight from the chlorophyll all merge and mix together to create food. All of these raw materials are converted through a chemical process and result in something new. Chlorophyll absorbs the sunlight from the environment and utilizes its energy while converting both carbon dioxide and water into oxygen and a form of glucose. While photosynthesis takes place, chlorophyll produces energy in the form of sugary carbohydrates, which aids the plant in its growth and development. Chlorophyll and the whole photosynthesis process are encased inside an organelle called a chloroplast. Chlorophyll is also the pigment that gives plants their green color. Since chlorophyll is a light-absorbing pigment, it absorbs both red and blue light of the white light spectrum and reflects green light. This is the reason the human eye sees green in plants. There are two types: chlorophyll A and chlorophyll B. However, chlorophyll doesn’t last for a long time. In the autumn or winter months, the plants, specifically the leaves, change colors from green into shades of gold, brown, red, and burgundy. This happens due to the lack of chlorophyll left in the plants or leaves. Chlorophyll, the green pigment, is lost while other pigments in the plant become visible; these pigments are called carotenoids. Since chlorophyll also contains carotenoids, shades of red and yellow can be found in plants as well. Carotenoids can also be found in fruits and flowers; for example, carrots and tomatoes get their color from this type of pigment. They also exist in the plant’s leaves, but are hidden by the chlorophyll during certain periods of time. When the chlorophyll wears off, it is replaced by carotenoids, turning the leaf into various shades or combinations of red and yellow. On the other hand, chloroplasts are plant membranes or organelles located in the plant cells and other organisms that utilize photosynthesis to make their own food. Chloroplasts are the organelles that conduct the process of photosynthesis as well of the location where photosynthesis takes place. They are also green in color due to their use of chlorophyll and its presence on the membranes. Chloroplasts are usually found in a plant’s leaves. There are hundreds of thousands of chloroplasts in every square millimeter of a plant leaf. 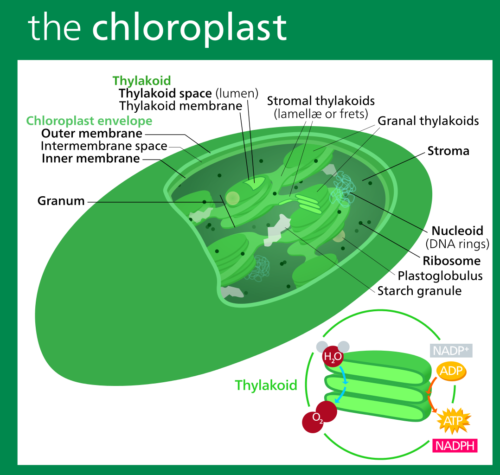 1.Chlorophyll is a light-absorbing plant molecule, while chloroplasts are plant organelles. 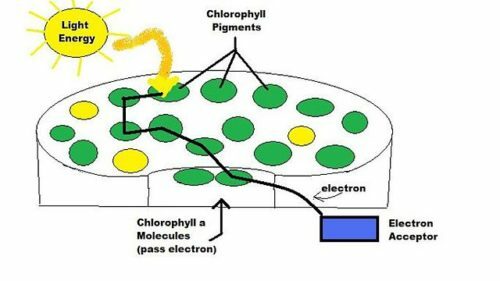 2.Chlorophyll paves the way for light to conduct the process of photosynthesis; at the same time, it is the chloroplasts that organize and conduct the whole process. 3.Chlorophyll has two kinds: A and B. 4.Chlorophyll is the source of plants’ green pigments, while chloroplasts are green in color due to the chlorophyll they contain. 5.Aside from the green pigment, chlorophyll also contains carotenoids, which are red and yellow pigments. Chloroplasts do not produce pigments at all. 6.Chloroplasts are found in great concentrations in plant leaves. Chlorophyll is found inside the chloroplasts. 7.Chlorophyll is part of the chloroplast, while chloroplasts are part of the plant cell. Celine. "Difference Between Chlorophyll and Chloroplasts." DifferenceBetween.net. May 22, 2017 < http://www.differencebetween.net/science/nature/difference-between-chlorophyll-and-chloroplasts/ >. This needs sources for validity. Please allow me to begin by saying I have a made-up name for my identity’s sake. All I need to say is that the moderators (or the owner) of this website may need time on such things. Also, they may not be able to control ads.